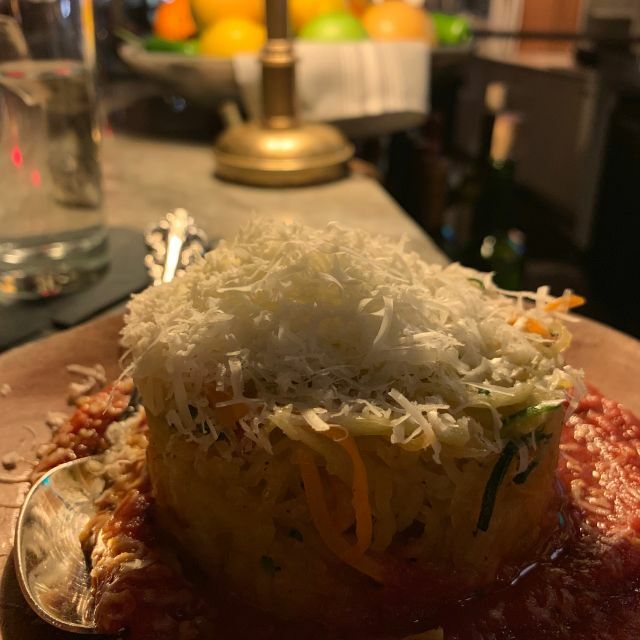 Enoteca Tredici in Bryn Mawr is an Italian/Mediterranean restaurant with welcoming wine bar serving varied small plates & vino in half & full pours. We were thrilled to have chosen the perfect Sunday brunch spot while visiting our son in Philly. Enoteca Tredici is beautiful, the tables are comfortable and the food was delicious! We were there on their second day of Sunday buffet brunch (the regular menu was available) but we opted for the $25 buffet. There was a carving station with fantastic prime rib and turkey, large juicy shrimp, two tasty salads, three or four kinds of eggs, three kinds of breakfast meat, fancy French toast, pancakes, fresh fruit, a variety of juice, salami, prosciutto, cheese and toasty bread, bagels with all the fixings, a coconut acaia cup and a dessert table that included perfect, tiny macarons, carrot cake, donuts and more. Some of the sauces, dressings and toppings pushed the meal into the next level of yummy. Our service was wonderful and the manager stopped by our table to welcome us and see if we needed anything. I highly recommend this place and we will be returning! Great food but very noisy place. It was even hard to hear the waitress. This place is an interesting spot. We found out about it by watching Chopped on Food Network as one of the chefs was on this show recently. The menu looked good and the chef did a great job on the show, so we decided to try it out. The atmosphere is very unique and inviting. Upscale tapas to say the least. The service I feel could have been a bit better especially for all of the money we spent. The food was good and you can tell it was made with a lot of thought. We were told the portions were large, enough to share....this was not the case. 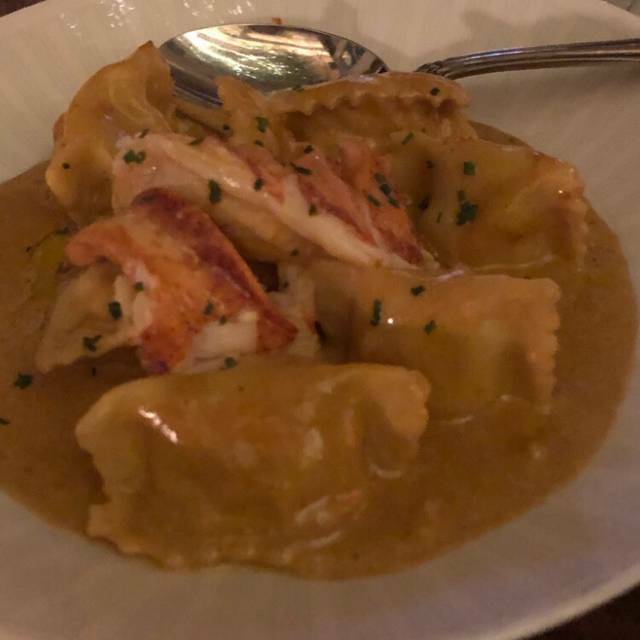 The seafood special was langostino...the server said this was a 9 oz serving, but I am not sure if we even got 2 oz of meat out of it and it was $52 with nothing else to it. The spinach gnocchi was delicious, but again, it only came with about 6-7 gnocchi in a quick red vodka sauce and was not able to be shared as they stated. We actually got two orders of this because we were hungry at the end still. The flat bread is actually a pizza (flat breads in my eyes are more rectangular) - there's was circular. For the amount of money our bill was this night, I am not sure if we will be back anytime soon. I feel like you can get the same quality food, bigger portions and better service at a ton of different other establishments and maybe even save a few bucks. It was a treat to try and I wish them well. Always a great experience!! From Steve the Manager to Renee the bartender! 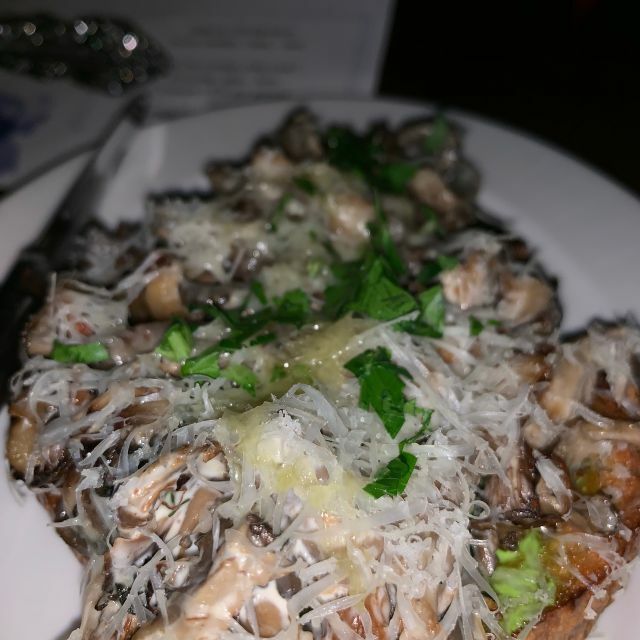 Food was great, mushroom crostini is a staple!! FOOD, ATMOSPHERE AND SERVICE WAS SPECTACULAR. THE MANAGER IS ATTENTIVE AS WELL. WE ARE COMING BACK FOR MOTHERS DAY BRUNCH!!!! Food is very interesting and thoughtful, portions are generous. Plenty of vegetarian options. The service was lovely and prompt although the restaurant was full. The fish of the day (sea bass, that day) was well prepared. Tables are well spaced so you have some privacy. They also have a nice private dining room for parties. Great atmosphere! Food was excellent! Staff is very friendly. Great, the manager is personally attentive and makes the experience! The food was very good. The service was terrible, borderline rude. The space is visually interesting but very loud. Wines were overpriced. Celebrated the husbands 59th birthday here last night at our 8:30 reservation. From the moment we entered the door, the experience was simply enjoyable at every turn. Our server, Gail, was non-pretentious, knowledgeable about the menu and was on point with every suggestion. Cocktails were beautiful to look at and almost too pretty to drink, but we know that didn't happen. We split a half dozen raw oysters that were out of this world perfect. We also split the most creative presentation of cauliflower "toast" topped with chunks of Maryland crab that was full of soft-crunch flavor. I had the lollipop lamb chops seared exactly as I requested and the hubs had the flat iron chicken with THE most savory brown butter sauce I've ever tasted. The kitchen here shines. Our server hooked us up with a couple of Irish coffees topped with creme that totally exceeded our expectations, service was prompt without being rushed. I just can't say enough about this dinner last night. Bravo to all! Can't wait to return. This was our first visit and was blown away by the food, ambiance and service. We had an early reservation and was able to take advantage of the "early bird" 3 course menu. Everything we tried was amazing and abundant. The restaurant is gorgeous. We will definitely be back!! I could have been in one of Europe's finest restaurants. Everything was perfect. The service was extraordinary. We went early (reservations were hard to get) and even at 5:00 pm the crowd was festive and everyone was enjoying themselves. Try the Greek salad WITH the broccoli and avocado - two separate appetizers but excellent side by side. Overall the food was really good! The gnocchi was not my favorite, not light and the tomatoes were not cooked but otherwise we like the pizza and the vegetables a lot! One of the best restaurants in PA! Outstanding food, service and ambience. What a dining experience should be. First off our waitress Devon was amazing! So nice and so informative of the menu and the restaurant! If you make a reservation, ask to sit in her section - so lovely. I had read many reviews of the restaurant on here, and other people recommended her as well - so I was excited we sat in her section. The food was good. 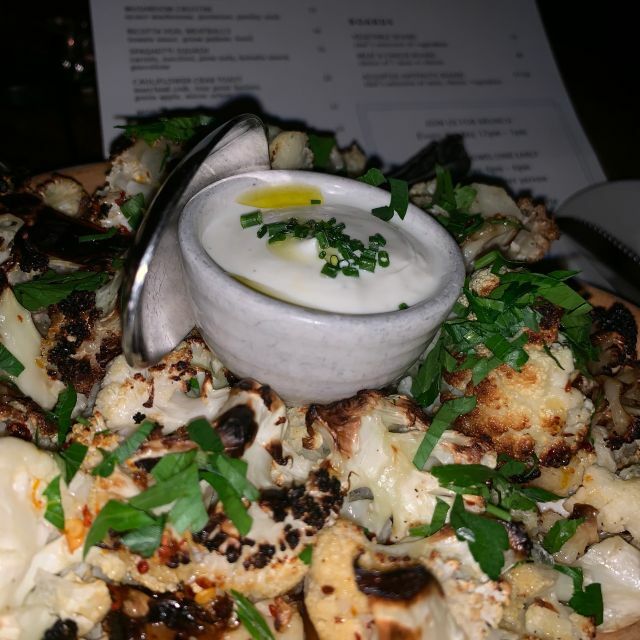 The roasted cauliflower was delicious! The mushroom and fava beans were amazing. The Chicken Parm was not bad. My husband got the gnocchi and liked it. I would try a different main dish next time. The wine is a bit expensive so we went with the beers which were good! overall a nice dining experience. Service was outstanding on a busy Friday night! The food was quite good and original. We really enjoyed the whole experience! Absolutely delicious food and wine with a lively and energetic but perfectly pleasant atmosphere. 10/10 would recommend for any date night/girls’ night/family night! It was super loud. Also, our waiter seemed not to care too much about us. We were at a table they squeezed into a doorway that made it awkward with waiters coming through and by super close - and still they didn’t notice when we needed refills on our water or drinks. Also, the menu has lots of words but it doesn’t always explain what you are about to order. Great place! Atmosphere was nice and service was great. Everyone was very friendly! The restaurant is beautiful, the food is great, except for poached salmon entree that was underwhelming. The 4-6pm deal was an unexpected bonus. No problems with service - it was prompt and non pretentious. Loved the appetizer meatballs and the desserts - especially the olive oil cake. Fantastic in all ways, we will be back. They lined the kale salad bowl with ricotta, such innovations! Always enjoy stopping here for a quick dinner when we have business in Bryn Mawr. Always friendly welcomed upon arrival and good service when seated. Good selections of wines by the glass and the Bryn Mawrtini was a fun and tasty drink. We tend to do small plates and the tuna crudo, beet salad did not disappoint. The crab toast was interesting with lump crab atop a "toast" of cauliflower. I was disappointed that the crab cake appetizer was recently removed due to a new menu published. The butterscotch pot de creme was a nice shared dessert accompanied by delicious coffee. Have come here a couple of times now and have loved it every time! Good is great, service is very good and friendly, inside decor is so cute and warm! Great food. Beautiful restaurant. Devon was an amazing server! Can’t wait to go back! Mater D, and waiter were excellent. the ambiance second to none. Food is always delicious and the ambiance is great. Great Restaurant for a Special Occassions! Beautiful ambience, the cocktails & food selections are healthy & outstanding! The service is Extraordinary! Beautiful decor, lively people watching, great food and service. Our waiter was not that great~ we ordered 9 small plates to share between 6 of us and said if we need to oreder more should we just let you know... his response was well you did order 9... I think you will be ok! Very rude to say to a table of ladies! Then he forgot our oysters and then tried to say we never ordered them after earlier asking how many we wanted. Then at dessert time we did not get one of our desserts and were charge for it! He then couldn’t believe we didn’t get it ~ like we were lying about it. Went here for a girls night out and had a great time. Decided to split a few small plates and can’t say anything we tried wasn’t delicious. Only thing that wasn’t my favorite is I wish the pizza crust had been a bit more solid but was still very yummy. Great food and service is a spectacular space. Good location, plenty of parking. Delicious variety of small plates makes for a fun meal to share. Particularly like all the great vegetable dishes available. Excellent service, attentive without being intrusive. The room itself is beautiful, and the noise level blessedly subdued enough that conversation can actually be heard. Will definitely be visiting again. The food was wonderfully presented and delicious. The service was exceptional.